While this beautiful stadium might be new, football fans have experienced this match-up before, when the Rams and Patriots played against each other in the 2002 Super Bowl. If the Patriots claim this year’s win, it will be their sixth time receiving the Lombardi trophy, tying them with the Steelers for the most Super Bowl wins. Whether you are for the Rams or the Patriots, the perfect Super Bowl party can be a winner with delicious recipes fit for a quarterback. Check out sweet and savory dishes below to kick off your perfect Sunday night football party with your favorite: The Perfect Pineapple. 8 oz. bag of raw unsalted pecan halves, a little more just in case some are cracked. Cut the crown off of your Chestnut Hill Farms Perfect Pineapple, and slice the fruit half lengthwise (long) so it lays flat. Set aside the fruit, and reserve the crown of the pineapple for ending decor. Scoop out and chop about a cup of the pineapple fruit. Set aside. In a medium bowl, add the softened cream cheese and grainy mustard. Beat with an electric mixer until smooth and creamy. With a spatula, fold in the reserved pineapple, colored peppers, chopped pecans, olives, onions and parsley, making sure everything gets mixed in. Taste and add whatever you would like more of. Refrigerate the mixture overnight in a bowl covered with plastic wrap. When ready to serve, place cream cheese mixture onto your serving platter, shaping like a football. Remember the crown is going to be placed on top, therefore allow room on your serving platter when positioning the cream cheese mixture. Decorate the pecan halves from top to bottom covering the sides as best you can, overlapping the pecans to cover most of the cheese mixture. Position the crown in place at the top of your creation, and add your dipping veggies, crackers and chips all around. Want more great recipes for Superbowl? Get the Recipe for The Perfect Pineapple Salsa! Get the Recipe for Perfect Pineapple Bacon Poppers! 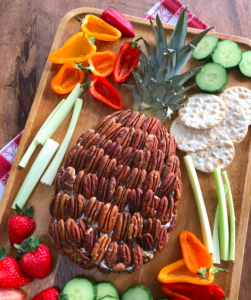 This entry was posted in Featured, Latest News, Recipes and tagged 2019 superbowl, party ideas, pineapple, superbowl, superbowl party, superbowl recipes. Bookmark the permalink.